Powerless and lost, Ben Grimm and Johnny Storm must fight for their survival in a savage wasteland ruled by… the Spider! Will this dreaded enemy destroy them — or will the shocking revelations they face do it first? Then, it’s a new life in a new town on a strange world. 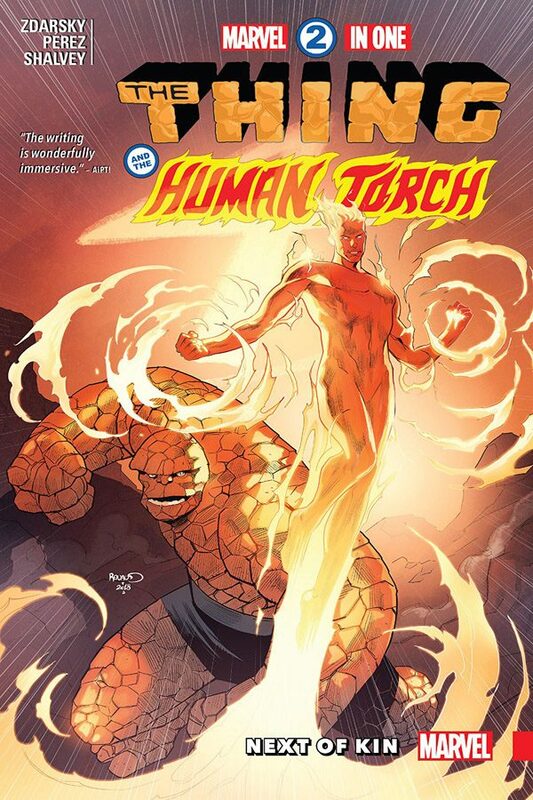 Everything has changed for the broken people once known as the Thing and the Human Torch. But can they repair things before one of their oldest villains puts the final nail in the coffin of the Fantastic Four? Wait, did someone mention the FF? They’re back! But there’s something not quite right about them. Plus: The Thing and his oldest enemy in new armor — the Infamous Iron Man! And the Two-In-One team-up you’ve all waited years for! Collects Marvel Two-In-One (2017) #7-12.